The Gray Wolf (Canis lupus) is the largest extant canid in the world. It can be found in Eurasia, North America and North Africa. It is one of the most popular animals in the world to study - more books have been written about the Gray Wolf than probably any other wild animal. It has a relationship of conflict with humans, because wolves have been feared and hated in most agricultural societies for taking livestock, which funnily enough have given them a reputation for being man-eaters. However, most documented incidents in which wolves have attacked humans have been attributed to individuals who were suffering from rabies. Northern Wolves. These wolves are large in body and in brain size, found in the northern parts of North America, Europe and Asia. They have large carnassials (teeth used to shear flesh and bone, found in most large carnivorous mammals). Their evolutionary history shows their lineage going back only about 150,000 years. Southern Wolves. These are found in North Africa, South Asia and the Arabian Peninsula. They are smaller than Northern Wolves and have thinner coats, lacking the bushy underwool that helps Northern Wolves survive in cold temperatures. They don't typically howl - rather, their most common vocalization is barking. 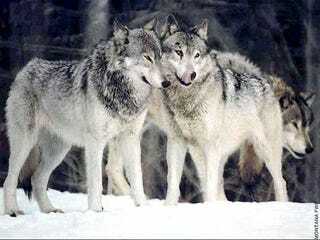 They are older than Northern Wolves, their lineage going back 800,000 years. Gray Wolves are social animals, living in packs led by a mated pair and supported by their adult offspring. Larger packs are made of two to three of these family groups, and in the best conditions produce litters of pups once each year. Wolves will leave their packs because of competition to mate or food scarcity, but it's unlikely that they would ever be accepted into another pack. A very small number of wolves live and survive on their own. Wolves are extremely territorial, and will sometimes claim larger territories than are needed to survive, either because of lack of competition, or to ensure a steady source of prey for growing pups. They feed primarily on large ungulates. Core territory usually averages 14 square miles, and wolf packs rarely leave it, though they are constantly on the move through their territory in search of prey. The largest observed territory was held by a pack of 10 wolves in Alaska. They had claimed 2,422 square miles. Gray Wolves usually mate for life, forming monogamous partnerships that are rarely dissolved, except in the case of death. These are pack leaders - it's unusual to see sexually mature females without a mate. An unattached male who leaves his family pack in order to mate will usually be unable to form a pair bond or claim a territory. Instead, he will mate with the daughters of of established pairs in other packs - these males are called Casanova wolves. In this way, some packs can have multiple breeding females, and sometimes the pups from one litter are adopted by other wolves - this is called alloparental care. Homosexual mating behavior has also been observed - males will often mount each other when the boss female comes into heat. After a gestation period of 62 to 75 days, female wolves will give birth to a litter of 5 to 6 pups, and litter size is usually dependent on the abundance of prey. Experienced wolf mothers will den in the same place that they've whelped in previous years, usually toward the center of the territory (where conflicts with other packs are less likely). First-time wolf mothers will den near the place they were born. Gray Wolves are very intelligent, demonstrating the ability to learn, remember and associate. During westward expansion in the United States, the bison which were once plentiful in the Great Plains were being systematically exterminated. Local wolf packs learned to listen for gunshots, and fed on the skinned and abandoned carcasses. Montana wolves learned to avoid open spaces when they heard aircraft, because of aerial hunts. They are able to distinguish between humans that are armed and unarmed. Wolves that have become familiar with traps are able to avoid and even disable them without being hurt. Gray Wolves howl in order to assemble the pack before and after hunts, to communicate across great distances in unfamiliar territories or bad weather, and to raise the general alarm. Males and females howl slightly differently, and younger wolves of both genders usually end their howls with short yips. Packs of wolves howling together howl in harmony, using different notes in order to make the pack seem larger than it would if they all howled on the same note. The greatest threat to the Gray Wolf is humans, as they were nearly wiped out due to single-minded persecution and extermination from the Middle Ages to the 1900s. Efforts are being made to re-introduce small populations of Gray Wolf to areas they traditionally claimed as territory, like this project in Yellowstone National Park.